Cwmbran grew up in the shadow of the South Wales Coalfield in the 1940s, making it a relatively new town by British standards. Like most modern planned urban areas, however, you’ll find everything you need right here in town. Locals are kept entertained by a shopping centre boasting shops catering to almost any need, a bowling alley and cinema where people can meet and have fun, and a new nightclub for those who want to party into the wee hours. For people wanting a little more entertainment or variety, the town is only 25 minutes from the capital city by car and close to one of the country’s most beautiful national parks. With a choice of schools and easy access to the rest of the country by motorway, for many people, Cwmbran is the place to be. And for their hog roast Cwmbran locals turn to us. Hog roasting is an ancient cooking technique that can also be applied to other meats like beef or poultry. Our machines combine ancient tradition and modern technology, allowing us to cook succulent and delicious meats with the utmost attention to food safety and sanitation. The cooking process takes longer than traditional oven cooking, because we have to allow for a certain amount of cooking time for each pound of meat – and a whole pig is a lot of meat! But the end result is well worth the wait. Of course, when we cater your event we will plan enough time to make sure the meat is fully cooked and perfectly succulent. Locals can also turn to us, because we know that sometimes you just want to roast the pig yourself. Our machines are easy to use and we will be happy to show you exactly how the process works. We can cater for any sort of event, but we also understand that there is a special thrill about being able to slow roast your own meat on a spit. That’s why we also hire out the machines. We have five set menus to choose from and we can cater for any gathering. If you want to enjoy the outdoors we are happy to say that our machines work just as well outdoors as inside and we can roast meat just as easily in the winter as in the summer. As well as pigs, we can roast whole lamb or beef, or if you prefer poultry we also offer chicken and turkey. Vegetarians are covered too – we can make up special vegetarian meals that never touch the meat – ask us if you need more information about any of our food options. For simple functions we can do roast pig in sandwich buns, but our menus also include options with sides and salads, and even canapés for those extra-special occasions or for gatherings where you want more variety to the spread. With all of these options available there is no wonder that for hog roast Cwmbran locals turn to us for all their catering needs. With the capital being so close, if you live in the town you might want to take a trip to the sea or to the big city. Luckily we can provide catering in any area, but we can also let you rent the machine to take with you on your trip, or arrange for you to pick it up when you get there. This means that whatever the nature of your celebration or holiday plans, and wherever you choose to hold your event, you can be sure of a real feast provided by our excellent cooking machines. But why should you want to hire a machine? Wouldn’t it be easier for us to cater your event? Some people do find it easier to leave the catering to the professionals and sometimes easier is better, but sometimes you just want to do things yourself. Once you have tasted meat the way we cook it using our special machines, you will wonder why you have never tasted meat this good before. 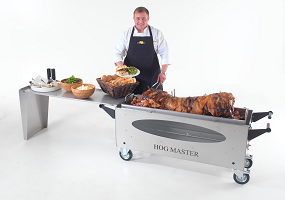 If life seems to be lacking a certain something, you can be sure that the thrill of a hog roast will bring back the spark.